Why sacrifice style when you're on the beach? 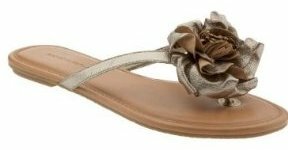 Banana Republic adds a bit of feminine flair to our feet with these Mayerhs Flip Flops. The Mayerhs is one of those pairs of shoes that girly girls can't resist slipping on their feet. They'll be taken in by that large rose with its soft petals. Its metallic finish gives it more glitz than a traditional blush pink or bright red finish. It's not the sort of rose you'd ever see in a country garden, but it'll look beautiful when the summer sun hits it! A quarter inch heel offers a bit more style than a complete flat would, but it shouldn't give you any trouble on the sand. That upper is made from leather so it'll feel fabulous on your feet. Banana Republic has cut corners on the lining though by using synthetic instead. It should feel just as comfortable thanks to the memory foam padding and cushioned insole, but your feet may sweat against this man-made material. The trade off, of course, is the price; in this case a relatively reasonable $59.50. A flexible rubber sole outersole completes the Mayerhs. I can't imagine any girl wearing such feminine flip flops will be pounding the pavement, but this finish should provide a decent amount of shock absorption anyway. Most of us will just care that these Mayerhs shoes are cute, but it's nice to know there's some substance behind that frothy design. The J. Crew Camellia flip flops are a cute alternative to these flower flip flops.